AIR takes a unique, easy-to-understand approach to examining the human and cultural side of technology trends – specifically, the interaction with applications and the growing security implications that result personally and for businesses and their IT organizations. Based on research involving more than 2,000 business and IT professionals at companies from various industries around the world- including India, AIR addresses the rise in use and significance of apps in our “blended lives,” in which lines blur between how the global workforce manages work and personal business through use of apps at home, in the office and anywhere in between. · APPS AS A BASIC HUMAN NECESSITY: Half (50%) of all global respondents consider apps to be as or almost as important as breathing, eating and drinking. · GIVE ME APPS OR GIVE ME DARKNESS: The survey also found that access to apps on a smartphone was equally as important as the ability to have access to sunlight or outdoor exposure. In fact, India at 68 percent, had the highest percentage of respondents who that claimed apps to be as significant – or nearly so – as air, food, water and shelter. · IN AN EMERGENCY: More respondents (45%) would grab their smartphone on the way out of their homes – if given the choice of only taking one item – over a safe with important documents (36%), their personal photo albums (12%), or a desktop or laptop (7%). · THE WEAKEST LINK – MOBILE PHONES OR IoT DEVICES? Laptops are perceived as more vulnerable than mobile phones, when compared to a list that also includes IoT devices like surveillance cameras, smart TVs and Internet-enabled cars – all of which are, to many respondents, are unknowingly vulnerable as well. On the mobile phone front Indians lose their mobile devices almost twice as much as the global average thereby increasing the vulnerability quotient.
. LEAVE YOUR HOUSE OR PHONE UNLOCKED? More participants would rather leave their house unlocked for a whole day than leave their unlocked phone on a park bench for an hour, with 52% choosing the former. · SECURITY A CONSIDERATION – BUT ONLY AT FIRST: Although over four out of five (83%) either agree or strongly agree that they think about security risks when first downloading an app, after that, security becomes much less of a concern,ranking behind performance (32%) and ease of use (24%). 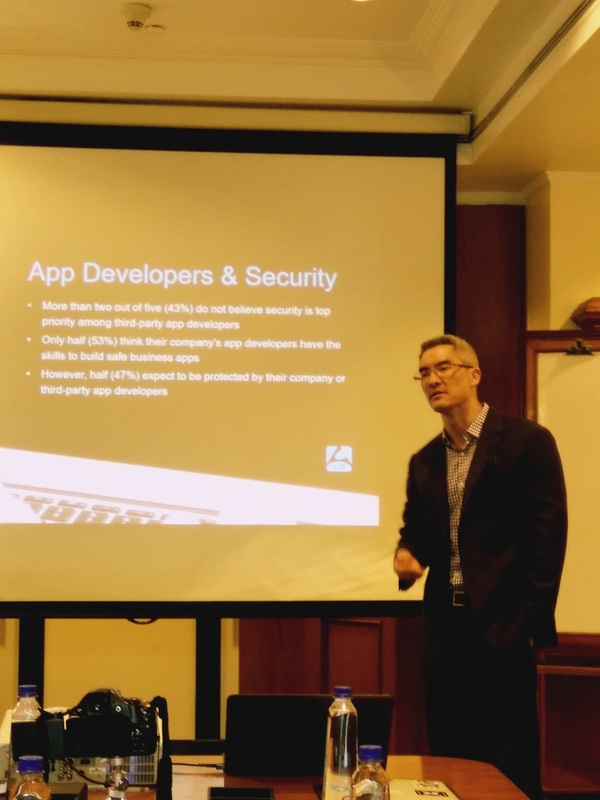 · TAKING RISKS: Even though they think app developers may not have security as their top concern – or have the proficiency to build secure apps at all – people still download apps and take their chances, as nearly half (47%) still expect to be protected from cyber-attacks by either their company or third-party app developers. · SECURITY AND WORK APPS: Roughly one in three (32%) surveyed think about security concerns when using personal apps. 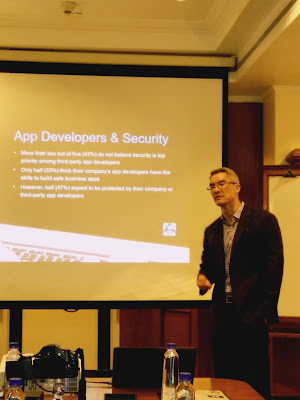 For business apps, security is even less of a thought, as fewer than one in five (17%) surveyed cite security as a top thought when using them. · IDENTITY THEFT – THE NEW RITE OF PASSAGE: More than one in 10 respondents (13%) say they have been a victim of identity theft. And by a wide margin, the younger the generation, the more likely the person is to be a victim of identity theft: Nearly one in five (19%) in their 20s reported having their identity stolen globally, while only 2% of those older than 50 cited the same. This finding raises questions about how many people do not know they have been victimized. · DIGITAL THEFT IS THE NEW REALITY: Nearly three out of five (59%) think having their mobile device hacked and personal information stolen is more realistic thanhaving their car broken into or their home burglarized. · CARELESS DIGITAL BEHAVIOR: Younger generations are also more careless with their personal devices, as one in three (34%) under 30 years old has lost their mobile device or computer, and one in four (24%) has had their mobile device stolen at least once. · PASSWORDS: One in 10 (11%) said they never change their passwords for their mobile apps, while another three out of 10 (29%) use the same password for the majority of their apps.